At the end of the street where I live stands a little chapel dedicated to St Anthony (it has a Facebook page). There’s a bus-stop next to it, and for a number of years I would get off the bus there at the end of almost every working day, and stop a moment to give thanks for the day, or to make a brief act of contrition, or just to say ‘St Anthony pray for us, Our Lady pray for us, Lord Jesus have mercy.’ (Since changing jobs I don’t pass that way so frequently, but I do go out of my way to visit the chapel from time to time.) There are usually candles burning behind the grille, and there is a slot in the brickwork that coins can be dropped into. Each of the coins offered there I take to be a token of some joy, sorrow or concern that someone has brought to the saint. The money goes to buy the candles. 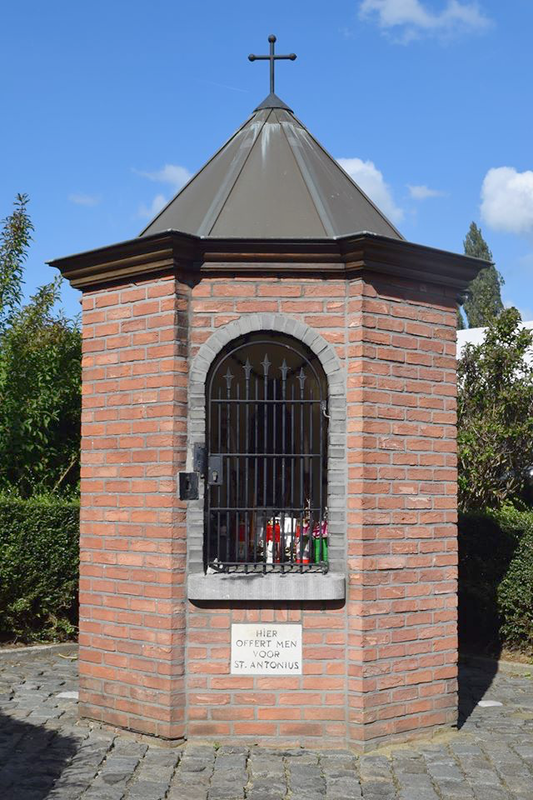 Roadside chapels are a common sight in Belgium, and when we moved to this neighbourhood I was pleased but not surprised to find one close by. A map from the 1770s shows a St Anthony chapel on the same location, but it is not the same one. In the 1790s Belgium was overrun by the armies of the French Revolution and suffered the sort of anticlerical murders and vandalism that were so much a part of the birth of the Republic. 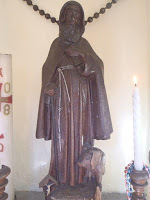 When the chapel shown on the old map was destroyed, a quick-thinking woman asked to have the statue of St Anthony for her children to play with. She put it in the attic of her farmhouse, out of harm’s way, where it remained for decades. By the middle of the 19th century the chapel had been rebuilt. But this is not what stands there today. In the late 1970s, the chapel was carefully dismantled during the building of a road. The bricks and stones were numbered and sent away for storage, but afterwards nobody could find out what had become of them. Only in the later 1980s, after persistent lobbying, did the local council replace the chapel it had mislaid. So while there has been a chapel on this spot for at least 250 years (and possibly far longer), the current structure is not yet thirty. It could stand as a symbol of the nature of tradition: only maintained by the renewed effort of each generation. The simple, physical proximity of this chapel has made St Anthony part of my life for 16 years without me really having known much about him. What follows are some jottings from my reading about him. There is a lot more out there, so the selection perhaps says as much about me as about him. Anthony is one of the first great monastic saints. 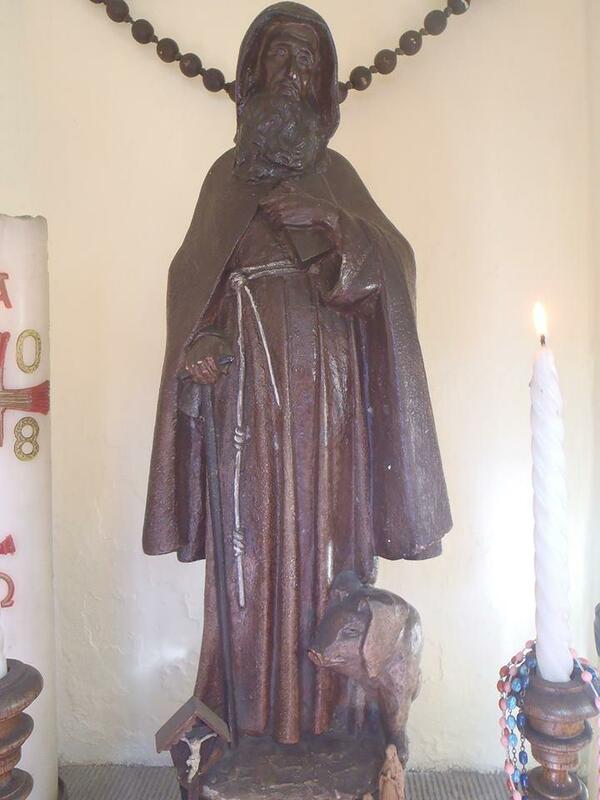 He is traditionally a patron of hospitals and hospices, and of pigs (for complicated reasons that have nothing to do with his own life, but probably explain the local chapel). An account of his life was written by a friend and admirer, Athanasius, Bishop of Alexandria, while in exile for being too vocal in his opposition to those with powerful political patrons who refused to accept the Nicene Creed as definitive. By Athanasius’s account, Anthony was an orphaned young man from a wealthy background who was inspired by the Gospel he heard read in church to sell his property and move into the Egyptian desert to pray in solitude. As followers, helpers and those needing help sought him out and joined him there, he became the ‘father’ of the first Christian monastic community, the first ‘abbot’, and one who could guide others in fighting temptation. 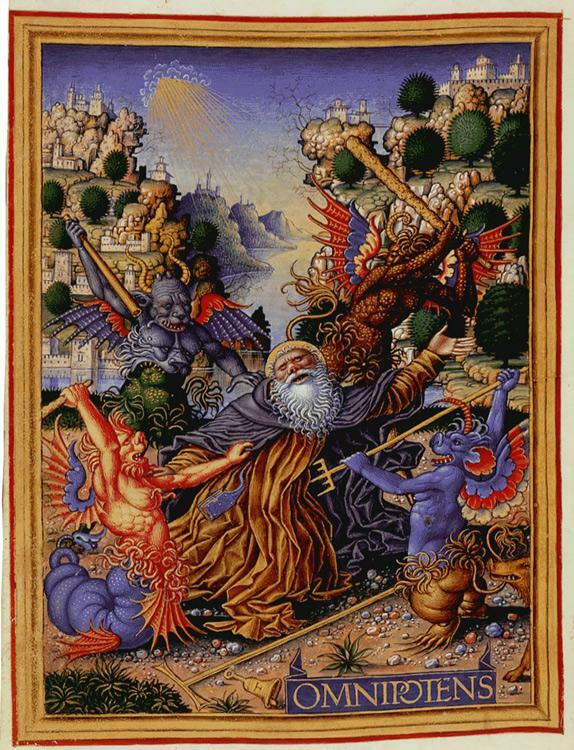 Since the Middle Ages Anthony has often been represented in Western art as a lonely figure beset by demons (as in the Sforza Hours, shown). 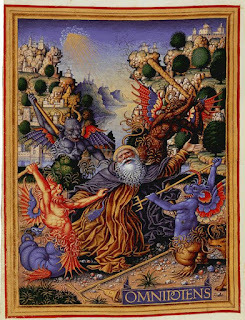 Artists of every period since have gravitated to this image of the solitary battling with temptation. For Romantics, the theme often seems an excuse to depict provocatively posed nudes, but in the earlier tradition, Anthony’s temptations were depicted as monstrous nuisances. It was only when he was a young man new to a solitary life that the devil tried him with the appearance of a naked woman, and other direct temptations to sin. As he grew in spiritual experience, the assaults became stranger and more subtle, aimed to terrify, distract, or make complacent, or even, most subtly of all: to use shame at past failings as a spur to more fearful devotion, to more frequent prayer and to more strenuous fasting than their intended victim could endure, instilling a sense of spiritual insufficiency and despair when exhaustion and unavoidable failure set in. But no heed must be paid them even if they arouse to prayer, even if they counsel us not to eat at all, even though they seem to accuse and cast shame upon us for those things which once they allowed. For they do this not for the sake of piety or truth, but that they may carry off the simple to despair; and that they may say the discipline is useless, and make men loathe the solitary life as a trouble and burden, and hinder those who in spite of them walk in it. Do not trust in your own righteousness. Do not go on sorrowing over a deed that is past. Keep your tongue and your belly under control. He who sits alone and is quiet has escaped from three wars: hearing, speaking, seeing; but there is one thing against which he must continually fight: his own heart. Anthony was never a sociable type. Even as a boy he disliked school because it meant mixing with other boys. This makes it all the stranger that the second common image is one of friendship (exemplified here in a medieval church carving from Normandy, photographed by a friend of my own). Friendship, as it happens, with my patron saint. There is a story not found in Athanasius’s biography, but recorded a generation later by St Jerome, one of whose catechists had been a companion of Anthony. According to Jerome, a young Egyptian called Paul, fearing he might break under torture, fled into the desert during the persecutions. Deep in the wilderness he found a cave, with a spring for water and a palm tree for shade and sustenance, and a number of ruined shacks. There he settled the remainder of his days, with the desert animals that visited the spring as his only companions. Anthony, after many years in the desert himself, was led to Paul’s hermitage by a dream (helped along the way by a centaur and a satyr, who are included in the story explicitly to make a point about the beastliness of men and the humanity of beasts, but also show what sort of folktales were being woven around the desert fathers within decades of their deaths). The meeting of the aged hermits was joyful, both of them of one mind shaped by years of prayer in the desert. They became firm friends the moment they met. There was one loaf for them to share, and much of the afternoon was spent in discussing who should break the bread, neither wanting to take precedence over the other. At length it was arranged that each should seize the loaf on the side nearest to himself, pull towards him, and keep for his own the part left in his hands. Then on hands and knees they drank a little water from the spring, and offering to God the sacrifice of praise passed the night in vigil. Paul told Anthony that he was close to death, and asked to be buried in a cloak that Anthony had been given by Bishop Athanasius, ‘not because he cared much whether his corpse when it decayed were clothed or naked (why should he indeed, when he had so long worn a garment of palm-leaves stitched together? ); but that he might soften his friend's regrets at his decease.’ The sensitivity and psychological subtlety of the desert fathers is remarkable. When Anthony returned with the cloak, Paul was dead. Anthony wrapped his corpse and buried it in a hole dug by two desert lions. In exchange he took Paul’s palm-leaf cloak, wearing it to celebrate Easter and Pentecost. Anthony attached great importance to burial, telling his monks that ‘he who did not bury the bodies of the dead after death transgressed the law.’ While neither of the sources for his life mentions it, there is an assumption in art that when he was buried, Paul’s cloak was his shroud. Paul the Hermit’s feast is 15 January, Anthony the Great’s is 17 January. Paul Arblaster is my second oldest internet acquaintance (The oldest is Mary who also comments on this blog.). I'm impressed that in the 1980s there would be enough people to mount a strong lobbying campaign for a public shrine, and enough sympathy in the corridors of power for such a campaign to be successful. Thanks for this, Paul. A picture of St Anthony and St Paul hangs in the house I grew up in, and hung there throughout my childhood, but Anthony is one of the saints I've known about so vaguely that it's embarrassing. This is great, Paul. Sorry for not saying anything earlier. My schedule has been changing and it's kept me busy. Thanks so much. 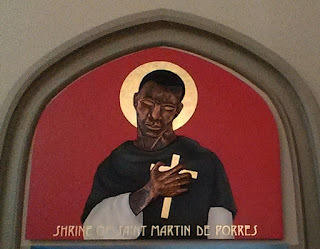 Now that I'm not on my phone--This St. Paul is your patron saint? That's very interesting. I'd never heard of him. "Do not go on sorrowing over a deed that is past." Such good advice--it's so easy to let your past paralyze you. One of the stories I would have included if I hadn't thought the post was getting too long is that of Anthony and the huntsmen, which can be found at this blog (by a different Mac). I think I first came across it in something by Thomas Merton and just found it on that blog by googling to find a version online. Again, it has a personal application. It's starting to dawn on me that while I don't drive myself hard spiritually, I do drive myself hard in other ways, and that interferes unduly with what really ought to be more important (prayer and family, and other things). But I'm also wary of finding excuses for my natural slothfulness. The other is his conversation with a visiting philosopher, who asked him how he managed without the consolation of books. He replied, "My book is nature, and I can read God's words in at any time." That sense of closeness to nature, and to God revealed in His creation, is something I'll come back to in my next contribution, about St Cuthbert. I can't imagine living without books. That's real asceticism. I meant to mention earlier how excited I was by the news, published a couple of weeks ago, that a new Hieronymus Bosch painting of St Anthony had been identified in a collection in the States. The story (and a picture of the painting) can be found here.